The PC84SC is an American style fridge freezer with two fridge doors and two large freezer drawers. It is 70cm wide, offering an American style fridge freezer in a more compact size. It comes with an impressive A++ energy rating and a 4 star freezer rating for ultimate efficiency and uncompromising food safety. An LED interior light gives crisp and clear illumination and the stylish stainless steel interior means that this fridge freezer will be a stand out appliance in any kitchen. Big and built to make a statement, our range of American style refrigeration combines the best of design and style to offer a functional and beautiful focal piece for your kitchen. With full height doors on most models, you can see your whole weekly shop at a glance and make quick and easy decisions about dinner and snacks. What’s more, when you bring the weekly shop home or have it delivered you can fling open both the fridge and freezer doors to quickly get everything stowed away to maintain freshness. On our French door style models, the freezer drawers slide out for easy and convenient access to all of your freezer storage. Also, with our flexible four door PC900 model there is a multi-zone feature that allows one of the freezer compartments to be used as a fridge, should you need extra cool storage at any time. Fast freeze and super cool are useful features in this range as they add extra, temporary cooling power in either the fridge or freezer when you need it to bring new items down to temperature quickly, without compromising on the storage of items already in the appliance. All our freezers are rated 4 star, which is the regulated rating for long term freezer storage and essential if you want to preserve meat in your appliance. They are frost-free too so you will never have to worry about emptying and defrosting your freezer because of a build-up of ice. 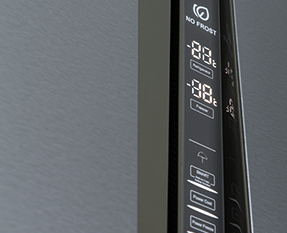 There are easy controls to adjust the temperature settings on our American style range as well as to switch on specialist functions like the holiday mode or to select the size of ice you would like from the dispenser. Some of our models have unique functions like the Q drink timer on the PC900. It allows you to quickly cool beverages with an audible alert to remind you to take it out again. Perfect for a party! Open door alarms will prevent family members from forgetting to close the fridge door after use and a high temperature alarm will alert you if your safe storage temperatures are compromised at all. The LED interior lighting is crisp and bright to give great illumination when you are looking to see what is at the back of your shelving. LED is also far more energy efficient and can last up to 50 times longer than an incandescent bulb. Every effort possible has been made to include the very best in energy efficient technology, functional practicality and storage space to bring you impressive refrigerated cabinetry for your home. We have included holiday energy saving modes, recessed handle design features, climate controlled storage drawers, integrated bottle racks and a variety of finishes to provide a comprehensive range for discerning customers. All that is left for you to do is select the style and size of model that best suits your kitchen design and lifestyle the most. Whether that is steel, black, with ice and water or a convenient home bar whichever American style fridge freezer you go for you are guaranteed practical style that could become the heart of your kitchen design.